Ask most English speakers for a list of vowels and they will offer up “A-E-I-O-U and sometimes Y.” And they’re right. In a way. 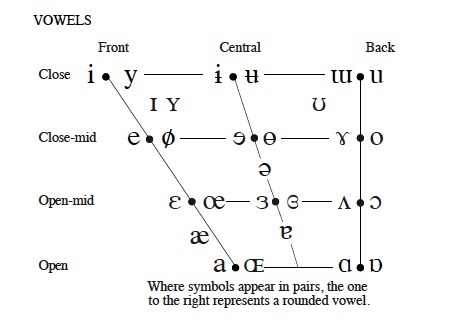 They do know what they’re talking about, it’s just that they’re not really giving you the complete picture… The letters A-E-I-O-U and sometimes Y are known as vowels, but more specifically they are six written symbols that attempt to represent many more spoken sounds of speech. Take for instance the dialect known as Standard American English (the dialect you may have learned in your acting conservatory–the dialect popularized in the mid-twentieth century by Edith Skinner). In the ‘Standard American’ dialect as taught by Edith Skinner there are fifteen pure vowel sounds a.k.a monophthongs (MAH-nuff-thongz), and seven blended vowel sounds, the latter being referred to as diphthongs (DIFF-thongz) or triphthongs (TRIFF-thongz) depending on the number of pure vowels that make them up. And if you examine the consonants, the pattern is similar. There are 21 written consonants in the alphabet (I’m including ‘Y’ in the count. ), yet in Skinner’s ‘Standard American’ dialect there are 26 spoken consonant sounds. By now you may be starting to get the idea that Spoken English and Written English (while related) might just be two very different entities. If you would like further evidence, try cold-reading aloud this poem written by Lord Cromer published in ‘The Spectator’ in 1902. Written English is not very successful at accurately representing how a word is intended (by its writer) to be spoken. Oddly enough, there are very few writing systems in the entire world that accurately reflect how the writer is intending one to pronounce the words s/he has written. One written system that does aim to accurately reflect spoken language (all languages, all dialects, all accents) is The International Phonetic Alphabet, a.k.a. the IPA. Many actors learn to use this writing system in order to accurately be able to mark dialect changes in their scripts, and to years later be able to pick up their dialect notes and still know exactly what they mean. A firm grasp on the IPA is an incredible tool to have as an actor. It can save you valuable time, allow you to become accurate with a dialect more quickly, and help you discuss your work with your dialect coach. I will tell you honestly that the IPA looks daunting at first. I will tell you also that some of the people who will offer to teach you about this system are firmly rooted in a normative mindset, and so may try to convince you that certain ways of speaking are superior to others. (You’ll have to kindly remind them that you are an actor and that for your career flexibility is the best option.) Please don’t let either of these little challenges inhibit you from learning how to use the IPA. If you put in some research time, you will soon find there are many dialect coaches out there who are competent teachers of the IPA that also have a keen understanding of the demands of acting. Besides, what is more refreshing for the mind and soul than a good challenge? So—-would you like to see a little of the IPA? If you’ve never had exposure to it before, or have unpleasant memories about it from some former training program, you might wish to start with the University of Iowa’s Phonetic Flash Animation Project This project does not show you all of the IPA symbols in chart form. Instead, you select a language (American English, German, Spanish–language, not dialect) and can then choose vowel or consonant symbols that you would like to see demonstrated on video. My personal opinion is that this project needs a few tweaks and video re-do’s here and there, but for the most part this is a solid introduction to the IPA. If you are already familiar with some of the IPA and would like to see the complete IPA chart including all of it’s modifiers (and promise not to let it intimidate you!) then go to my ‘Further Resources‘ page and scroll to the third section which is marked: ‘Regarding Phonetics and Phonetic Description.’ The first entry there contains a link to the International Phonetics Association’s PDF of the complete chart. Whether or not you decide to visit these IPA links, simply knowing that ‘written English’ and ‘spoken English’ are two different things might save you some confusion when learning dialects. As always, send me your questions! I’m here to help!